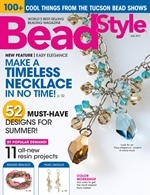 MiShel Designs: MiShel Designs Keshi Pearl Dangle Earrings in the latest issue of BeadStyle Magazine! 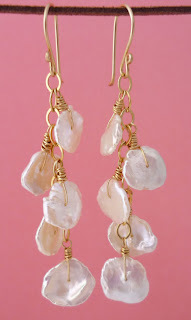 MiShel Designs Keshi Pearl Dangle Earrings in the latest issue of BeadStyle Magazine! Grab the July issue of BeadStyle Magazine which hits new stands on May 31st and you can see my Keshi Pearl Dangle Earrings on Page 80! Also, I'm really lovin' the Pearl Necklace for the June Birthstone section on page 20 by DonnaMarie Bates - Gorgeous!! I'm also fascinated with the "Tiny Treasures Eearrings" by Lori Mendenhall on page 34 - she makes me want to pour resin over some of my pearls!! And, you gotta see the "Newfangled Bangle" project on page 44 by Sherri Haab - Simply YUMMY!! Okay - go check out BeadStyle magazine yourself for all the cool projects and designs they've got jam packed into the July issue! Peace, Love and Happy Summer Beading! !